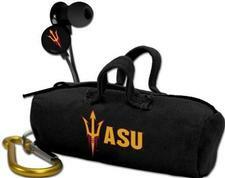 NCAA Scorch Earbuds with Budbag - $9.99 - GolfersEdgeOnline.com - Best Golf Equipment On The Web! Air Force Falcons Scorch Earbuds feature a metallic housing and shiny logo that pops. In-ear earbuds give full surround sound for an immersive listening experience. Each pair of Scorch earbuds comes with a free Air Force Falcons branded earbud bag from BudBags. If you have any more questions about the NCAA Scorch Earbuds with Budbag; do not see the model you are looking for; need custom options; or prefer to not purchase online, then please call us at (630) 656-1291.